Edisto is like stepping back in time. An enclave that's been carefully protected from the shifting winds of storms, from the swirls of commercial trends & fashions that come and go. She is sweetly isolated by miles of salt marsh & wide rivers. Pristine creeks that clearly reflect the sky and the clouds. She's an island with a strong sense of self-esteem. A place that doesn't look like everywhere else. 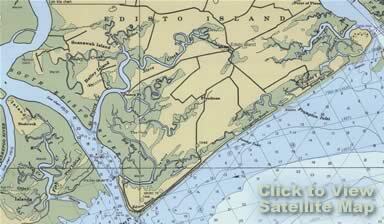 Edisto's its own unique spot on planet earth. A place of oak-lined alleys and pecan trees. Churchyards and Spanish moss. Folks who all know each other, and care. Churches of all different denominations who come together and meet, on a regular basis. Like a real community. A place where some mystery person perpetually decorates a tree, out in the middle of the marsh. Like Christmas in July. A place where you can get really good home-grown tomatoes. And some really great seafood. What better place to own a great beach house than wonderful Edisto Island?